Baobabs are cool plants. On the outside, they look like just another tree. But if you take a look inside, they’re a creature all their own. 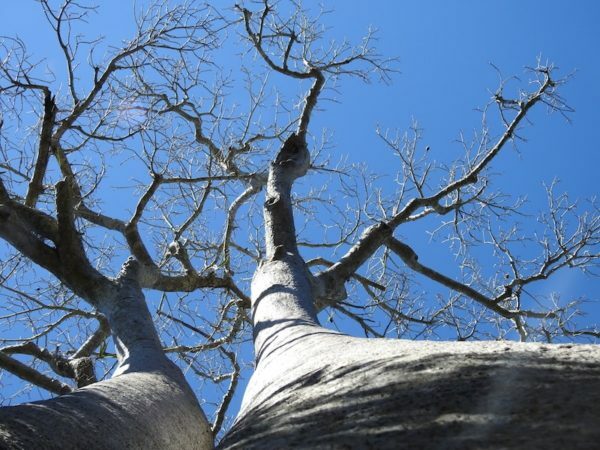 Unlike most trees, which have a central structure that grows outward in layer upon layer, year by year (visible in growth rings when you cut a tree down), baobabs’ insides look like an amalgamation of straws and sponges. Their special structure helps them hold onto water through long dry seasons. We saw this pair of baobab trees today (Adansonia za species) at Zombitse-Vohibasia National Park. 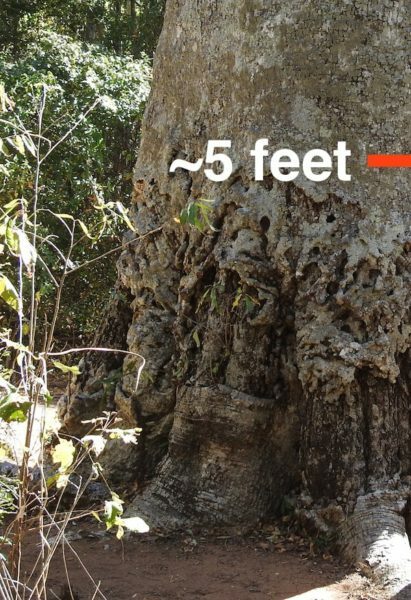 They towered over the rest of the forest, reaching about three times as high as the next tallest trees in the area. Baobabs are extremely slow-growing, reaching only knee height by the time they are 5–8 years old. So these specimens are estimated to be at least 500 years old. In a country where deforestation is such a huge problem, that’s a really long time. But baobabs are largely protected from axes because they make poor wood. If you kill a baobab tree, it simply shrivels up like a dried sponge. The remaining pulp is terrible fuel for cooking fires, and you can’t build a house or furniture with it. So people leave it alone, occasionally harvesting the fruit for its vitamin-rich pulp or letting their cattle eat the bark of a live tree when they’ve run out of grass to eat. While this latter practice would kill most trees, the baobab survives it, growing a new skin over the injured area. This other tree (below) is a great example of a baobab that was used to feed cattle, but continued to grow and thrive. Under the 5-foot mark, you can see where the bark was chewed up and then healed.